The Camelia Sinensis (tea plant) enjoys a warm, humid climate with temperatures ranging from 10 to 35 C. It needs a decent amount of rainfall and prefers a deep, light, acidic and well-drained soil. 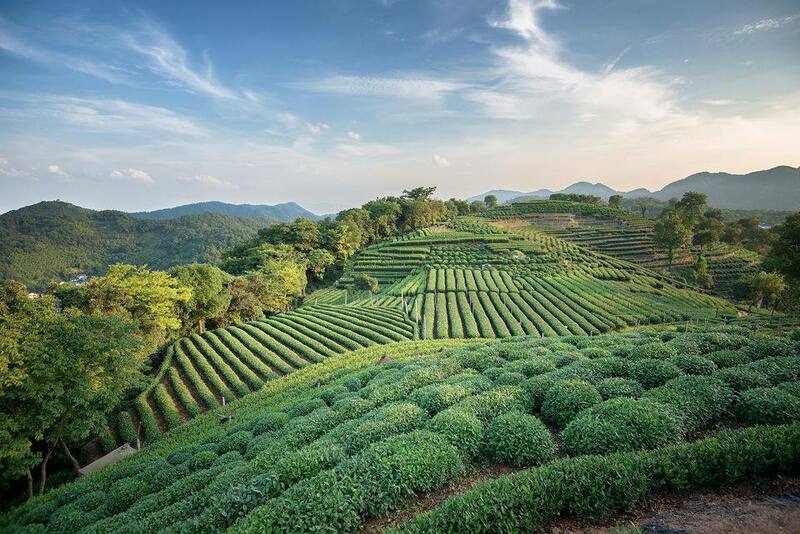 With the right conditions, the tea plant will grow anywhere from sea level up to altitudes of 2100m. Newly planted young shrubs are left untouched for two years before any pruning or plucking, but once old enough, they are pruned to keep them under a meter high. This regular pruning means that as new shoots (known as a ‘flush’) appear, they are easily visible to the pickers. It is these young green leaves which are used in tea production. Different plucks produce different qualities of tea; in Darjeeling, the first flush is considered the best; in Assam, it is the second. The delicate shoots are grasped lightly between the tip of the thumb and middle finger and in a deft, downward movement, broken off and thrown over the shoulder into baskets on the pickers’ back. Dependent on the location and of the tea plantation, plucking can take place every 7 to 14 days. Given that smaller leaves found in Darjeeling require 22,000 shoots per kilo of tea, or Assam where they are larger, 10,000, this is painstaking work. Sometimes a skilled worker will use shears, and there is machinery to trim the shoots, but as these will also include bits of stem and wood, producing a lower grade tea. The leaves are then taken into the factory, spread onto large trays and racks and left to wither in warm air. Once withered, the flaccid leaves are broken by rollers to release the juices and enzymes of the plant, which, as they come into contact with the air, oxidize. The broken leaves are laid out in a cool, humid atmosphere for several hours to ferment or oxidize until eventually, the leaves turn golden, and oxidization is complete. Finally, the oxidized leaves are dried completely, which further changes the color of the leaves to black. The tea is now "made." The tea will then be sorted into varying sizes before being weighed and packed into tea chests, some for loose tea and the remainder for tea bags. Along the way, the Factory Tea Tasters will check the flavor of the tea and make sure it is not contaminated, and once satisfied, samples will be sent to brokers to be evaluated for quality and of course, price. Green Tea: the withered leaf is steamed and rolled before drying to prevent the leaves from breaking and causing oxidation. White Tea: the buds are hand plucked and are withered so the natural moisture evaporates before drying. No oxidation takes place. Oolong Tea: is a cross between a black and green tea, with a much shorter oxidation, making it a fresh tasting tea but with sophisticated nuances of a black.